In 1905, then Forest Supervisor, Elers Koch, was on a honeymoon trip with his young bride when he came across an abandoned homestead, which, he discovered, was previously owned by the German settler, Savennach. He decided then and there that this was to be the location of the Region 1 tree nursery. During the Depression Era, the Works Progress Administration (WPA) developed the Civilian Conservation Corps (CCC), which brought hundreds of young men out to work across the nation. Their work can still be seen at Savenac. 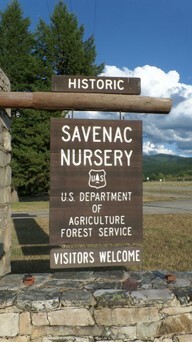 However, the heyday of the Nursery ended in 1969, when the nursery at Coeur d'Alene opened and Savenac closed; it remained mostly idle for the next 30 years. That is, until 1995, when the first Passport in Time (PIT) project at Savenac Nursery began with just one bucket of paint! This marks the Nursery's 24th PIT project and, once again, we need your help to keep this site at its best! If you are new to PIT, this is the deluxe of PIT projects - we even provide food and housing for our volunteers! So, come on home to Savenac Nursery once again!